This is for the serious big game hunter, where you are part of the “food chain”. My areas where I hunt are 65km out of Victoria Falls, all along the Matetsi hunting areas. Main species are Elephant, Buffalo, Leopard and Sable. You should be in good physical condition. Some days you will cover up to 8 hours of tracking. This is still a wild part of Africa. This is also where you will find the most affordable dangerous game safaris in Africa. We prefer to do Elephant hunting early in the season, Feb/March/April when large Elephants leave the National Park to feed on the local people’s crops. In the past 50lbs and larger have been harvested. The crocodile/hippo area is in the famous lake Kariba area, bordering Zambia. This is where I still manage to find 17ft crocodile on a regular basis. 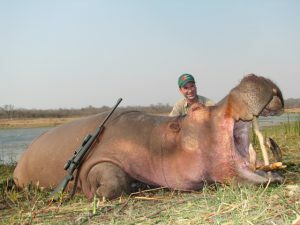 Hippos of 24″ and more have been harvested. These hunts are still done in the traditional way of going out on small river boats (mokoro’s). This is very exciting and a real adrenaline rush. The Victoria Falls are not far away, a visit to this world renowned site is highly recommended. You will have to book a connecting flight into Victoria Falls from O.R. Tambo. Me or one of my PH’s will personally be at the airport to assist you in any matter at the immigration office. You will buy your Visa at the airport. Remember, only a maximum of 2 rifles per person are permitted to be imported into Zimbabwe.